Life is precious. And if we don’t keep an eye on it it will flash by. 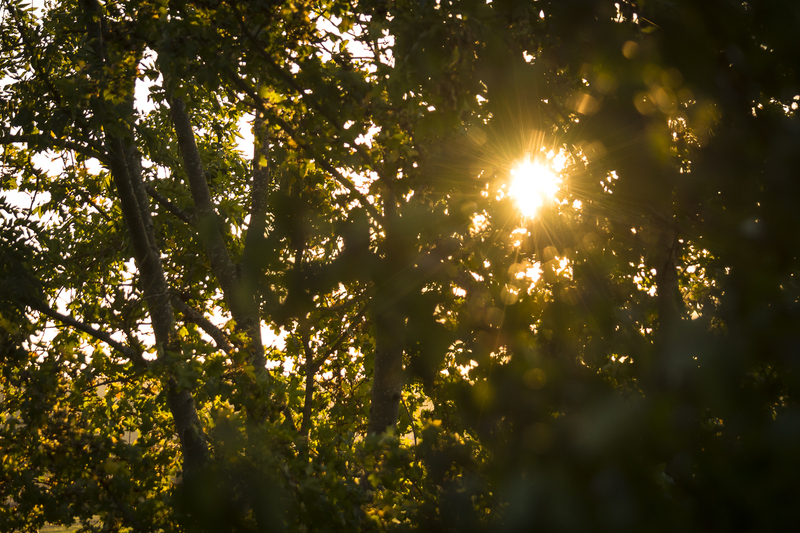 How often do we let annoyances stop us in our doings and end up not observing the small but good things in life. But aren’t those small things the best? A cup of tea in the morning, a bitter-sweet soundtrack at work, a vespertine stroll in the woods that are glowing in their autumnal dress right now. 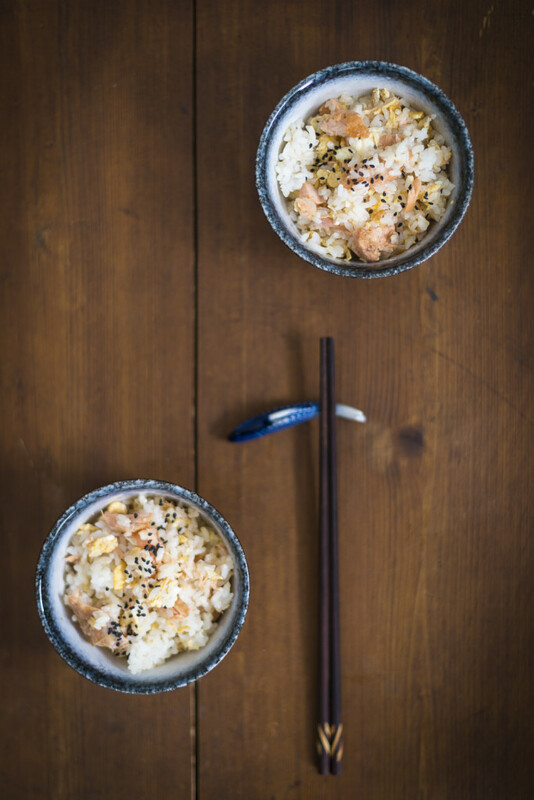 A kind word, an embrace, a meeting with dear friends… or a simple bowl of rice with salmon and egg. Actually a food out of leftovers from yesterday, but still so good today – so comforting and delicious – that it would be a shame not to respect them. I made this dish out of leftover rice and leftover butter-fried salmon from the previous day. But you also can use freshly steamed rice and just fry the salmon freshly as well. 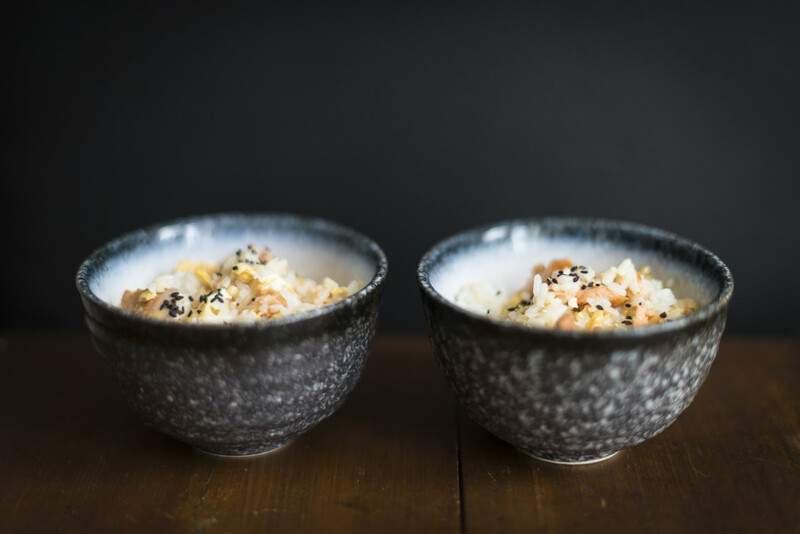 You can use raw and finely chopped salmon too, if you like… or you can even use smoked fish just as well. Use a fork or a pair of chopsticks to break the salmon filet into small pieces. Loosen up the rice with a spoon and mix it with the vinegar. Crack the eggs into a bowl and roughly mix them with the soy sauce. Heat up the sesame oil in a pan, add the egg mixture an stir while you let the eggs set. As soon as that happens add the rice, quickly stir and then add the salmon. Mix gently and divide into two bowls. Best served warm with a Japanese green tea.